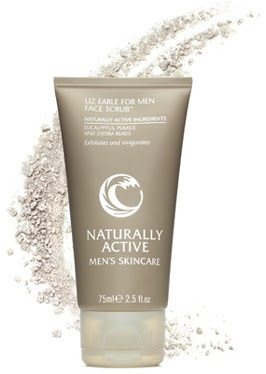 If you haven’t heard of Liz Earle Naturally Active Skincare For Men, you are not alone. In Europe this line is well known.... in the US, not so much. Liz Earle, the woman, is a UK beauty expert who specializes in botanical ingredients and natural health. Her Naturally Active Skincare products are well made and packed with natural ingredients. The product that’s been rocking my world is her Face Scrub. The scrub’s magic ingredients are pumice and Jojoba beads. Jojoba is a desert shrub which produces seeds that resemble large coffee beans. The seeds contain a wax that can be shaped into tiny spherical beads. These beads provide a gentle exfoliating action and leaves a clearer, brighter, more polished complexion. The scrub experience is very spa-like and the aroma is clean, thanks to a hint of eucaluptus. Also in the mix: beeswax and cocoa butter to help hydrate, protect and soothe the skin. After shaving or cleansing, wet your face thoroughly and apply to your face. Gently massage in with your fingertips using light, circular movements. Concentrate on the forehead, nose, chin, jaw line and neck but avoid your eye area. Fingertip pressure and the gentle massage of the pumice and jojoba will help wipe away dead skin cells, unblock pores and stimulate blood flow.